A cancer diagnosis is a shock. The life-threatening disease has a huge impact on a patient’s life, both physically and emotionally. Patients face a very difficult time, even while recovering. Ex-cancer patients face an enormous challenge when trying to pick up the pieces of their life. 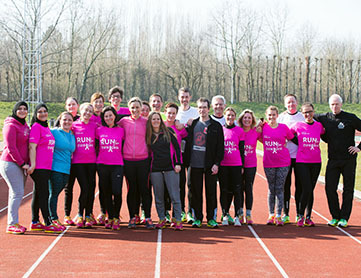 Together with AZ Monica and Think-Pink, the Universitair Ziekenhuis Antwerpen (UZA – University Hospital Antwerp) is taking on a unique commitment with the Tria-GO! research project. “The vision of care in oncology is that the patient is central in all aspects. Not only the medical aspects, but also the paramedic, psychological and social aspects are important both during and after treatment. For example, many hospitals provide oncology rehab, usually for a period of 2 to 3 months. But then everything stops,” says Professor Marc Peeters, Head of Oncology and Head Coordinator of the Multidisciplinary Oncology Centre. “Oncology rehab following curative cancer treatment is indeed an excellent programme for helping patients reintegrate into society. This is not enough, however, and is too short – patients are more or less left in the lurch after 3 months,” says Professor Sevilay Altintas, Medical Oncologist at UZA. The hospital has initiated a scientific-based research project, Tria-GO!, in which care providers, 12 ex-cancer patients and their buddies (husband, wife, brother, sister, friend, GP) train and prepare together for a quarter-triathlon. “Cancer and many types of cancer turn into a chronic disease with which the patient has to learn to live. Just because you have cancer, it doesn’t mean that you cannot do certain things, which is what we aim to prove with our Tria-GO! research project. Professor Stassijns of Physical Medicine, myself and Professor Altintas are also actively training for the quarter-triathlon, together with the 12 ex-cancer patients and their buddies,” explained Professor Peeters. What is clear to you is that you approach patients in a different manner. For nine months, under multidisciplinary supervision, the participants prepare for a 1,000 m swim, 45 km cycle ride and 10 km run. They are coached by triathlon trainer Rudi Frankinouille, who is a sports physiotherapist at UZA, with support from former swimming champion Mieke Smet. Rudi has been a top level trainer for 14 years. “I’ve experienced many good results with athletes. In its own way, this project is equally unique. Psychologists tell me that mentally coming to terms with cancer can take between 3 and 5 years. Most of these people have been cancer-free for only 1 to 3 years. They haven’t fully integrated back into society yet and are still fighting a battle, and we help them through this process,” says enthusiastic coach Rudi Frankinouille during a break in a Saturday training session. Participants are not triathletes. Despite their treatment and the psychological impact of the cancer diagnosis and treatment, they have already demonstrated that they can conquer this sporting challenge. Their enormous drive is obvious . “And that is important, because this challenge demands a huge investment in terms of time and commitment. Nevertheless, I’m convinced that everyone can reach the finishing line, and this represents a challenge to everyone - the former cancer patient, buddy, care provider and carer. The atmosphere in the group is electric, and we are convinced that we can bring this group over the finishing line. The relaxed approach and structure make the project feasible. The dynamics of the group, and the mental and multidisciplinary framework are crucial,” added Rudi Frankinouille. “We want to keep patients on the move, even after the project, because of the positive impact of exercise on health," concluded Professor Altintas. “What you also clearly feel is that you approach patients differently and are aware of their enormous drive.” concluded Professor Peeters. Click herefor more information about Tria-GO! For a period of twelve months, Janssen will be investigating unique care projects and visions in society. Tria-GO! is an independent project run by the University Hospital Antwerp (UZA) working together with AZ Monica and Think-Pink, illustrating how care needs an inclusive approach.